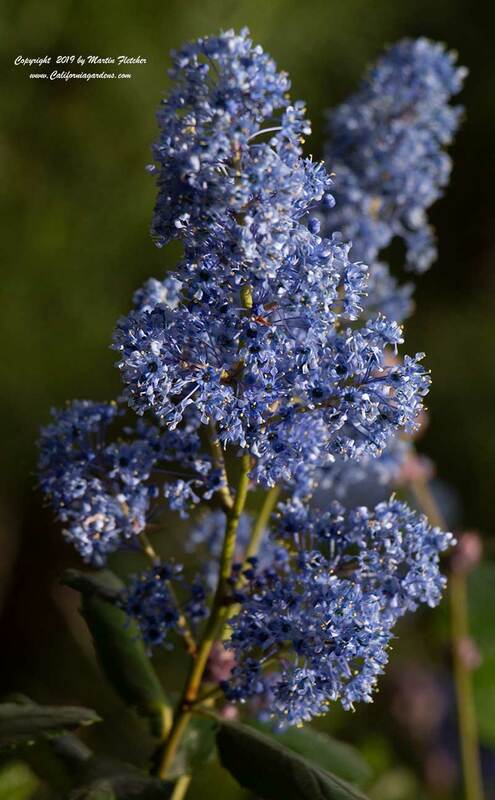 Ceanothus Tassajara Blue will grow to be a large robust shrub or even a small tree. Ceanothus Tassajara Blue even puts up with shearing as a hedge. Ceanothus Tassajara Blue is a hybrid between Ceanothus griseus and Ceanothus arboreus. Ceanothus Tassajara Blue has similar characteristics to Ceanothus Ray Hartman and grows to 15 feet or more tall and wide. Ceanothus Tassajara Blue will produce its blue flowers Winter into Spring, March to April in our area. Plants will survive longer if they are kept pretty dry once they have been established. I prefer to plant them on a slope or in well drained soil. Ceanothus Tassajara Blue is a host plant for the Western Tussock Moth Caterpillar and the Pale Tiger Swallowtail, and an early season nectar source for the Monarch Butterfly. Flowers and foliage of Ceanothus Tassajara Blue. High resolution photos are part of our garden image collection.